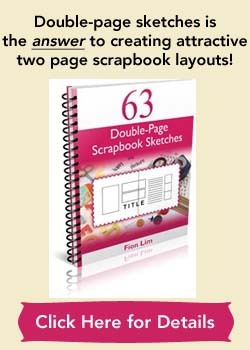 Viewing others’ scrapbook layouts is a great way to jump start your own creativity. It’s also a way to study how the page was put together by the scrapbooker. Looking at layouts can fill you with ideas that you can apply on your own pages. Do you like the overall arrangement of elements? Try it out on your next layout. Intrigued by the handmade embellishment? Try making your own version to lend a sparkle to your page. Attracted by the witty title? Try personalizing the title to suit your needs. Don’t fall into the same trap as me! Many of these published layouts are by professional scrapbookers or very artistic women. The purpose of these published layouts is not to put us down or make us feel that our scrapbooking efforts aren’t good enough. Their purpose is to wow our senses and to inspire us. Scrapbooking is supposed to be fun, a joy. 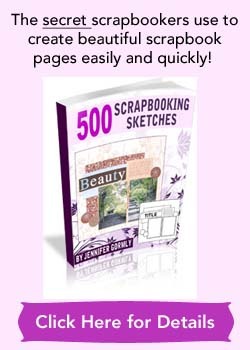 Let go of the unrealistic expectation that you have to scrapbook like a pro or make each scrapbook page shine like a star. If you have that natural ability, great for you! If not, it’s definitely okay! More importantly, you’re preserving memories, creating attractive pages, and having fun doing so! This website is created to encourage beginners to start scrapping. Everyone starts somewhere, including me. And if someone like me who used to believe that she’s not creative at all can do something like this, you can do it too!